After working and banding two months in the peruvian jungle I was looking forward to spending some relaxing days in Costa Rica with Laura and she (& Momo R.) chose the perfect place to stay; Uvita. Uvita has a huge and beautiful beach. The place is located in the Southwestern part of Costa Rica and is next to the National Park "Marino Ballena". There are no touristic hotels around, neither a good infrastructure to get to the beach which means that the beach is almost empty and quiet. You can only hear the sound of breaking waves, frogs in the swamps and birds flying over. We found a lovely hostel to stay, we definately enjoyed the place. The hostel is only a few meters away from the beach and has everything you need. You can find a link below. It was perfect for me! It´s the first time I went to the Pacific and to have a weekend at the beach like this was just in time. Enough time to relax, to regenerate and to see more of the country. For the moment we are in the rainy season which means it is raining every day, a lot. In Peru I was laughing about the situation and didn´t know what it means to be in the rainy season, now I know. It´s almost raining the whole day. There´s a little stop for 3-4 hours without rain which was every day between 6 am and 1 pm. Therefore we always planed to go swimming in the ocean or to have a walk to the whale tail in the morning. In the afternoon, when it started to rain, we used the time to have a nap or to play games. We had a short 3km walk to the whale tail. The top of the tail consist of stones and rocks. Inside there, Shorebirds using the place to hide and to look for food. It was the first time for me I observed birds in Costa Rica. Most of the birds are similar to peruvian birds but most of them are new for me which means I need to spend a long time for the identification in the book later. 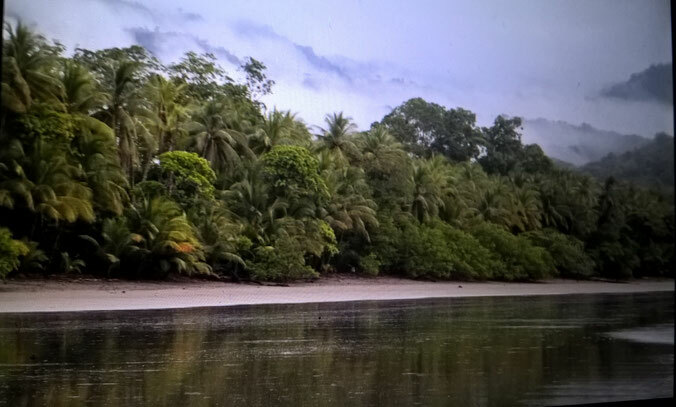 Another report about Uvita is in Laura´s blog. Definitely worth to have a look!